IsoNova’s animal health products are built on the strength of eggs’ natural immune-boosting properties. In collaboration with our customers, we are able to harness these properties to develop powerful and innovative solutions to pet food conundrums. Our dried egg products can be used to create and enhance the healthy pet foods that modern consumers demand for their dogs and cats. Egg product is the perfect protein for pet food products. Its yolk contains the protein Immunoglobulin Y (IgY), which supports the immune systems of developing animals, and its albumen contains the naturally anti-microbial lysozyme, which targets gram-positive bacteria. Want to lower the ash content of your egg product? No problem! Need a dense and potent protein? You got it! Interested in increasing the fat content? Sure thing! Our customers are able to customize their dried egg purchases based on the specific goals they have for their pet food products. Whether you’re focused on functional, nutritional, or basic health applications, you can find what you need amongst our high-quality egg products. 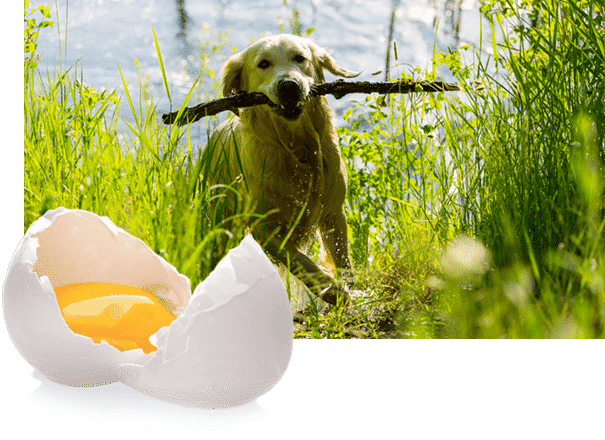 So as you create new animal health products or enhance the ones you already have, be sure to explore the possibilities presented by egg products. IsoNova’s naturally nutritious dried egg product offers vital protein and immune-boosting properties that satisfy consumers’ demands as well as manufacturers’ needs. To learn more about our proven methods and to explore how you can use our innovations to create premium animal health products, please contact IsoNova® today.